Bass fishing is fair. Fish are on docks and sea walls looking for food. Early morning feeding periods may show some top water action. Keep top water bait ready in the event that they feed. Bang A Lures, Pop R’s and floating Rapala’s are very good choices and use clear 8 pound Sufix line. Spinning reels are easy to us with these baits. The 4 inch Senko in bright colors on a Texas rig or with no weight is catching some very large spots mid lake around docks. Pick the docks half way in the backs of major creek, skips the baits under the dock and be sure to have fresh line. 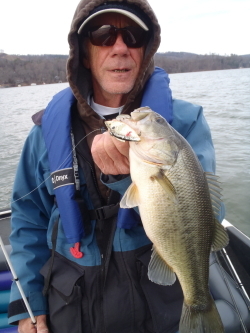 Another bait that will fool the bigger spots is a ½ ounce Stanley jig and a twin tail trailer especially after dark. Down lake on rocks, the Fat Albert dark grubs on a 1/16 or 1/8 lead head and a single or twin tail grub can work on main lake structure. Points and long banks right in the mouth of the lower lake creek can produce some good action. Cast the baits right on the bank and reel the back with a straight steady motion. Occasionally drop the bait and the fish will strike.